I have never thought of myself as a big fan of orange. Is it a new post-cataract surgery colour vision thing?. 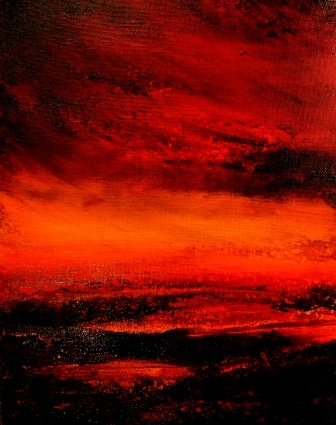 Is it the hot weather making me subconsciously feel I have to paint the heat? I really don’t know but these are two recent small works on canvas. “Industrial” is true mixed media… I almost threw everything at it. Starting with acrylic, partly applied with a palette knife in impasto style with texture media and some mica paste, I then used encaustic and a few spots of gold leaf. I love the textures… some flat, thin passages, others thick and luscious with the richness of pigmented beeswax. “Global warming?” is a luminous acrylic where I have experimented with new ways of applying the paint using, in part, crackle medium which did not work the way it should. That was great as I love the way the surface is subtly broken in places. I would love to repeat this in a larger work but I think it is truly a one-off as I don’t know if the same “mistakes” will happen again!!! It possibly works better smaller anyway as small encourages the viewer to look more closely at that textural surface. 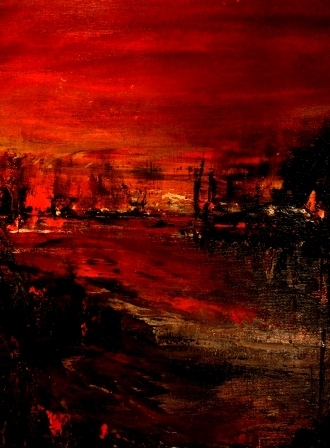 This entry was posted in All things Coastal, art, painting, Tasmanian artists and tagged acrylice, contemporary Australian art, crackle medium, encaustic art, experimental painting, heat, hot, impasto acrylic, industrial, mixed media, orange, texturaal paintings, wax painting, works on canvas.